This master bath was in desperate need of an overhaul—the corner tub took up a third of the floor space, and the toilet was directly across from the door. The designers reconfigured the bath by taking space from neighboring closets, repositioning the toilet, and adding a new double vanity. 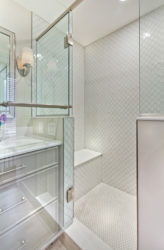 The enlarged shower, now with frameless door and panels, allows for an unobstructed view of the new tile and lets in natural light from the window, conveying a more open feel. 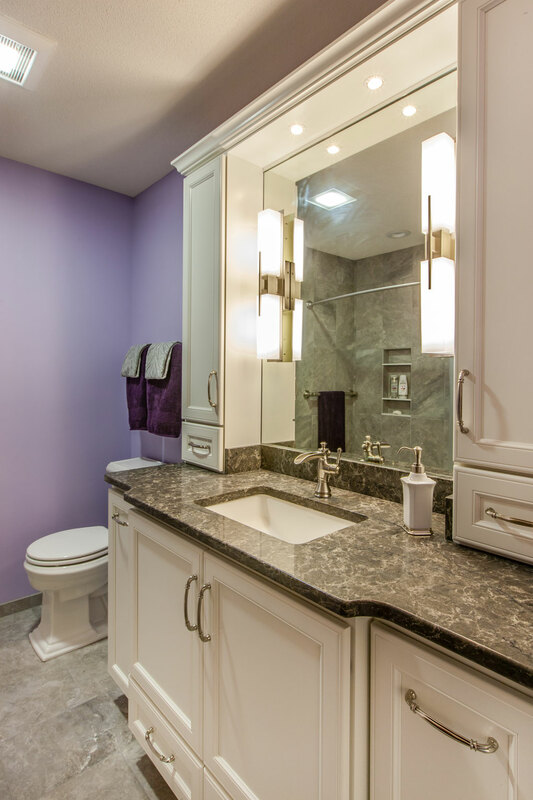 Stone, polished nickel fixtures, wainscot tile, and crystal knobs give this bath the appeal it deserves. The homeowners wished to respect the history of this home’s 1915 Prairie School architecture, while also giving it 21st century amenities. The original house had only one bathroom on the second floor, shared among five small bedrooms. For the homeowners—the only two living in the house—the second floor was impractical. The designers converted three bedrooms into a single master suite: Two formed the bedroom and the other the bath. The historic art-glass windows are in their original location, their square motif becoming a decorative note throughout the project. Custom-made light fixtures, and period-appropriate hardware, accessories, and paint colors all fit the character of the house. 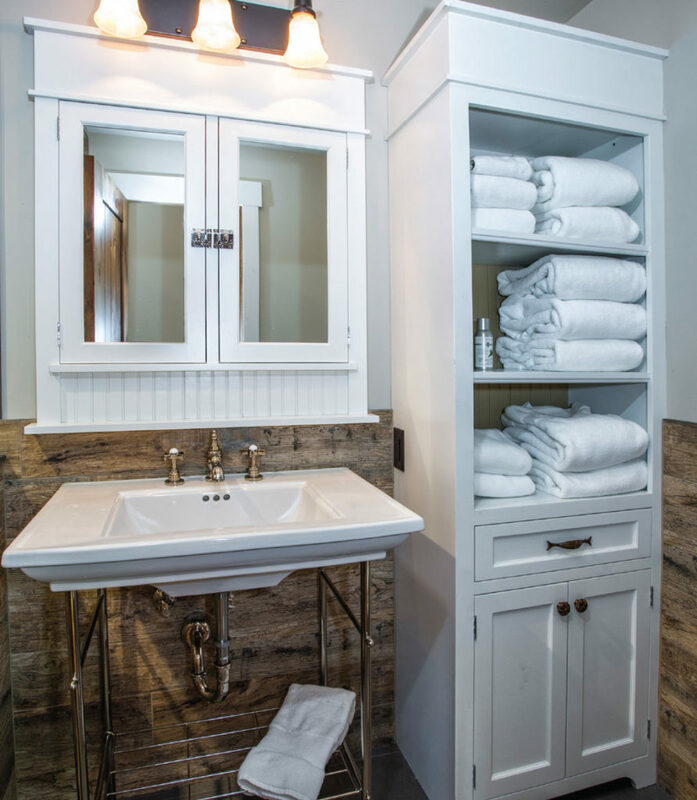 Every inch of this small, rustic bathroom is maximized for comfort as well as function. The wide top of the pedestal sink allows room for toiletries, while the open base below maintains visual space. The recessed medicine cabinet hides additional storage. Echoing the feel of an authentic outhouse, the tile on the walls is reminiscent of old barn boards, wrapping around and into the shower area. 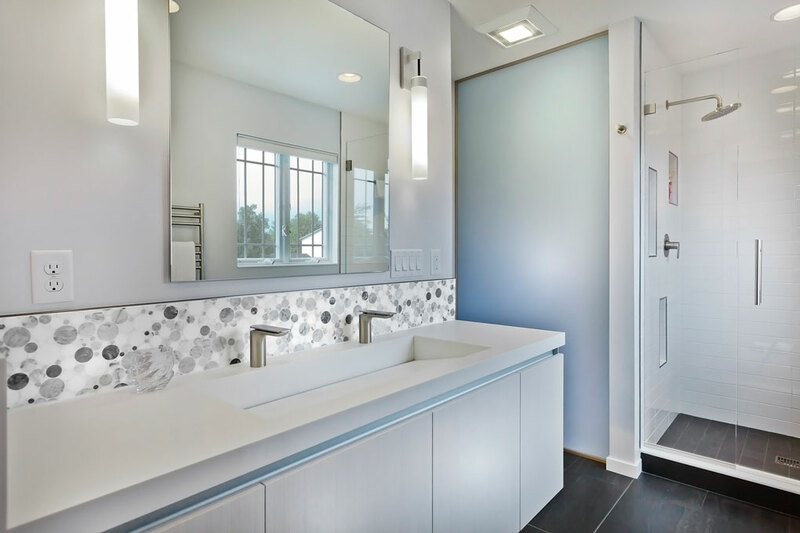 A seamless glass shower door and half-glass wall keep the space open to the rest of the bathroom. All together the designer crafted a bathroom with comfortable amenities, while also instilling an old-fashioned feel. Moving to a 1920s duplex in south Minneapolis from the suburbs, this client found most of what she wanted in a smaller home. Except for an updated bathroom. The designer’s solution for that problem: updated finishes in a calming, contemporary palette. Arabesque and penny-round tile in the shower, both in light-enhancing colors, and new can lighting create a fresh and inviting room. The frosted glass door that opens to the hallway also serves to carry light into the room. Reconfiguring the space also allowed for a larger shower with a bench seat and a bigger closet. The new heated floor has since become a favorite feature for the owner—and for her cat. This powder room was once a dark and dreary first-floor bath with an unused shower (since all the bedrooms are located on the second floor), little cabinet storage, and a too-small countertop. The homeowners wanted to convert the three-quarter bath into a farmhouse-style powder room. The designer eliminated the shower, relocated the toilet, and freed up an additional 12 inches of counter space. 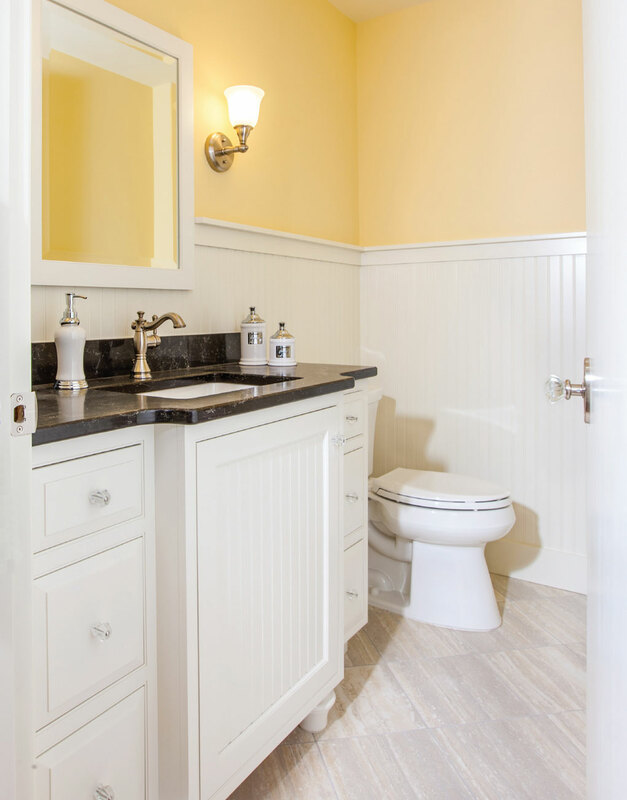 White cabinetry, bead-board wainscoting, and a splash of sunny yellow paint brighten the room. Every detail, right down to the crystal cabinet knobs is reminiscent of the farmhouse aesthetic. 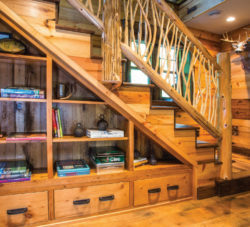 This unique stair rail, created by Ryan Holman of Ryan’s Rustic Railings in Orr, in collaboration with Russ Savstrom of Savstrom Custom Woodworking in Stillwater, added a functional piece of art to this rustic cabin. The lighter twig railing contrasts with the darker walls of reclaimed pine subtly enhancing the effect of the twisted branches. The final stage of the project included the angled cabinet under the staircase, an efficient and creative use of space that provided storage for books and board games. This townhouse kitchen had been updated a couple times in the past, but the homeowners hoped another redo would remedy a congested area around the island and table. They also wanted a larger island with more seating, and a kitchen that opened up to the dining and living rooms. The designers modified the traffic pattern by moving the sink to the now-sizeable island and replaced an existing wall with a large, arched opening to the rest of the living space. They freshened the look throughout by updating the color scheme to a crisp white. With her only daughter off at college, this busy executive decided to remodel her kitchen to suit her love of baking, cooking, and hosting holidays for her large family. Her wish list included white cabinetry, an island, plenty of storage space, and a gas insert for the fireplace. The designer found room for two ovens and a range-top on one wall by moving the mudroom doorway. The large marble-topped island is perfect for baking and includes customized storage for baking ingredients, spices, and trays. The wood-burning fireplace was converted to gas, its brick covered with marble to create a clean, updated feel. The result is an organized cook’s kitchen that gracefully transitions to entertaining. Previously tucked away in the basement of a charming, rustic, 1930s cabin, this kitchen was relocated up to the main level. The view of the St. Croix River was a priority, and focused the room and the placement of the appliances. The designer centered the farmhouse sink and the island on the span of windows. 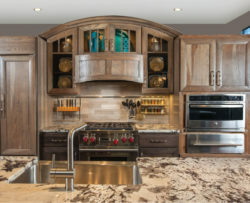 The range is built into the island with the hood overhead; the dishwasher is to the left of the sink near a custom dish cabinet with leaded, seeded-glass doors; and the refrigerator is on the right. 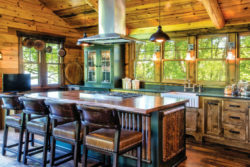 Finishes throughout reinforce the cabin’s rustic aesthetic, including the whisky barrel hickory flooring that is secured with square nails, the live-edge walnut top on the island, and the reclaimed pine on the walls and ceiling. The kitchen in this historic Minneapolis home had over-the-top embellishments, high countertops, and difficult-to-keep-clean surfaces. 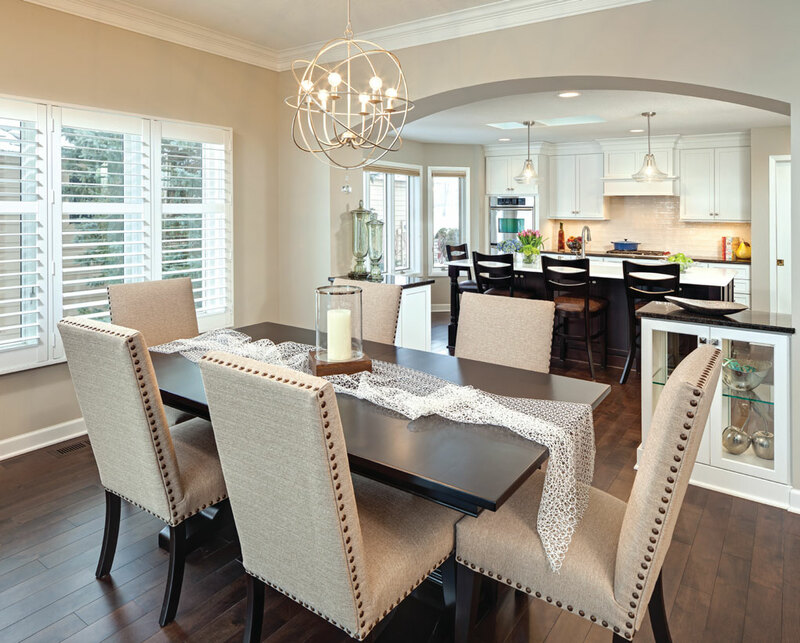 The homeowners, frequent cooks and entertainers, wanted a functional space with a European sensibility and ample room for casual gatherings with friends and family. 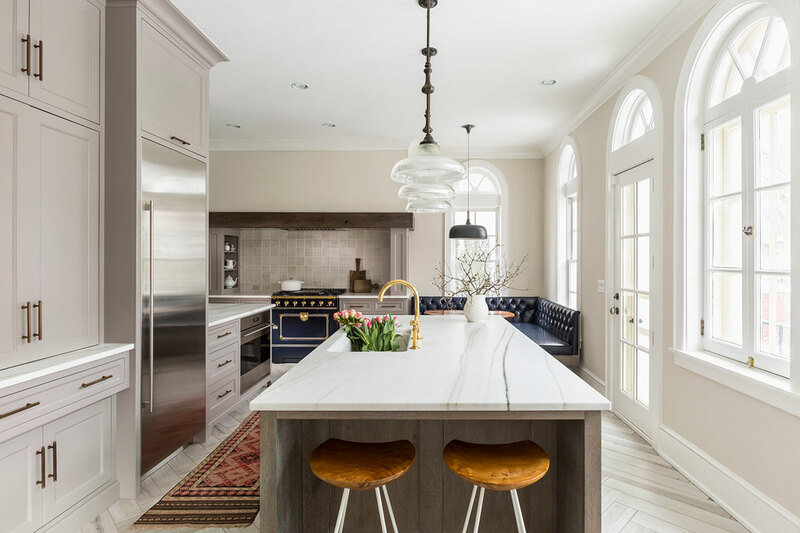 The designer created a space that embodies Belgian sophistication, using warm gray and cerused oak cabinetry, marble countertops and backsplash, a reclaimed oak hood surround, a French navy blue range, and a navy leather banquette—all while working within the existing footprint. This ’80s rambler already had an open-concept design, but the homeowners wanted to update the kitchen and surrounding spaces. Their wish list included more island seating, additional natural light, better access to the dining room, and a larger mudroom. 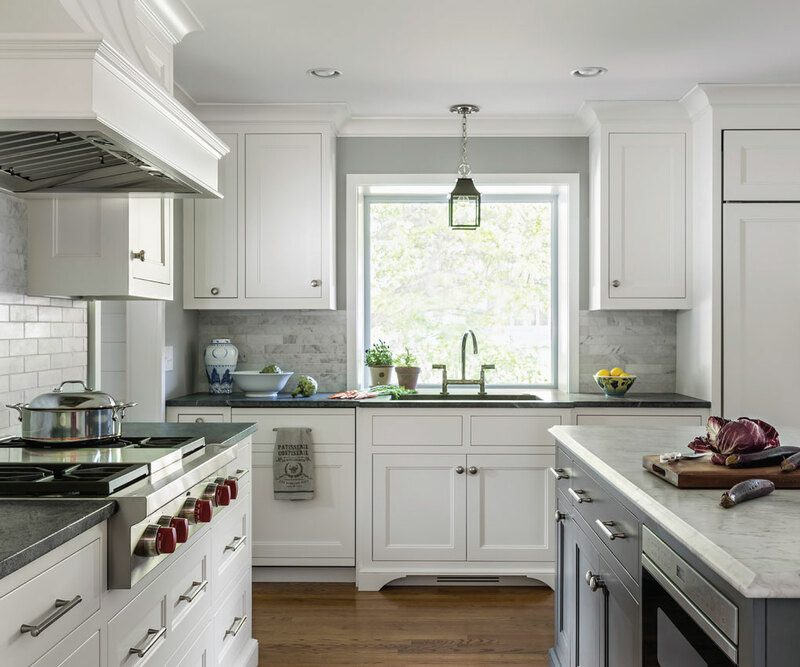 The designers began by relocating the kitchen to the backside of the house and eliminating the dinette table to make room for a large island, adding seating, more room for cooking, and allowing in loads of natural light. The kitchen relocation also opened up the perfect space for the formal dining room with wine storage and a beverage refrigerator. The mudroom’s footprint doubled, accommodating a bench and lockers. Current students enrolled in NKBA- accredited college programs selected this master suite remodel as their favorite entry. For this complete suite redo, the designers moved the closet wall forward to create a large walk-in—building in a medium-size dog kennel. A customized armoire and built-in drawers in the closet replaced several pieces of bedroom furniture. A wall paneled to the ceiling to create a new bed location is complemented by wainscot around the entire room. All, including the new trim, was enameled white to give the new suite a crisp, clean finish. While there was no client involved in this showroom design, the designers faced several challenges: tying together different flooring, displaying current trends, featuring multiple types of countertops, showcasing new and custom features, and fitting an unusually shaped space. The designers incorporated a large triangular island, creating three areas: work space, snack bar, and table area. 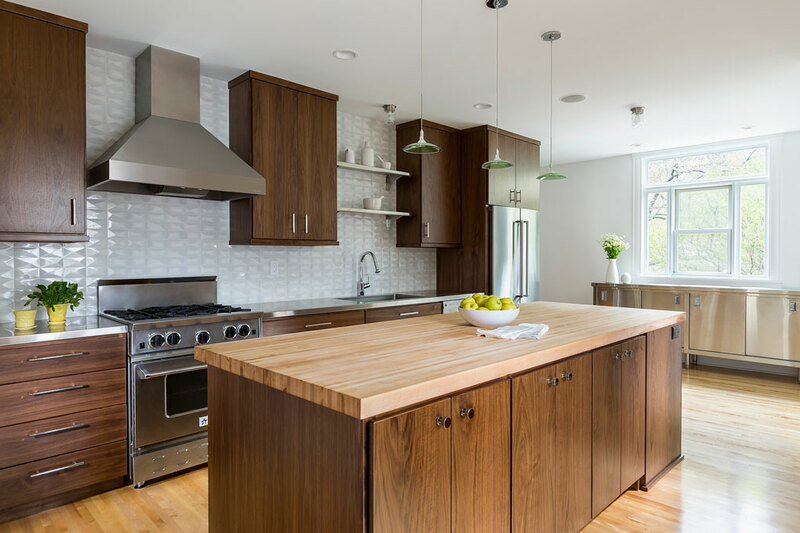 A floating soffit matches the shape of the island and lowers the ceiling. The two-toned cabinetry of wire-brushed hickory with a gray stain wash, and maple in a dark slate finish, keeps the display current and warm. 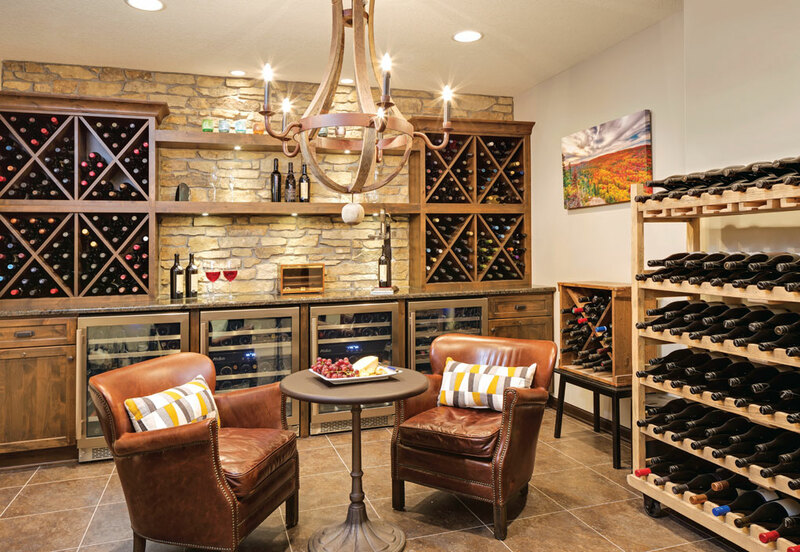 The goal of this project was to convert a cluttered storage area into a wine room with an authentic Mediterranean feel. The designers transformed the back wall with the stone veneer from counter to ceiling, inserting coolers and a set of stylized, diamond-bin cabinets. A granite countertop and luxury vinyl tiles on the floor maintain the aesthetic. Tying it all together are the recessed ceiling lights, puck lights in the floating shelves, and wine barrel chandelier centered over the comfy sitting area. The current owners of this 1930s cabin wanted to honor its history in the reconstruction. 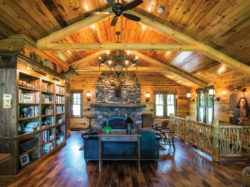 The original stone fireplace was acid washed to bring out its natural glory, and a century-old, reclaimed, white oak beam was hand-picked to fit over the mantle to add depth and proportion. A large, custom-built bookshelf conceals the refrigerator, acting as a seamless transition between the kitchen and great room. With whiskey barrel hickory as the floor and reclaimed pine with a natural finish on the walls and ceiling, the cabin retains its vintage look and feel. During the design phase of a kitchen remodel, the mudroom came up, but it wasn’t part of the project until the kitchen was underway. 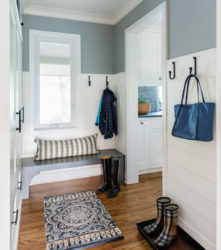 Since the homeowner wanted to keep the mudroom open to the kitchen, the designer used shiplap walls to integrate the window with the bench and armoire. This makes the room feel larger than it is and gives the walls a durable finish. The armoire stores coats and boots, while drawers and shelves hold gloves, hats, and other small items—all strategically tucked out of view from the kitchen. The designer reconfigured this main bath to create additional storage and more counter space. The designers updated back-to-back baths with light-sharing frosted glass and a neutral palette. The designer used warm finishes and contemporary style to update the kitchen in a Victorian home. 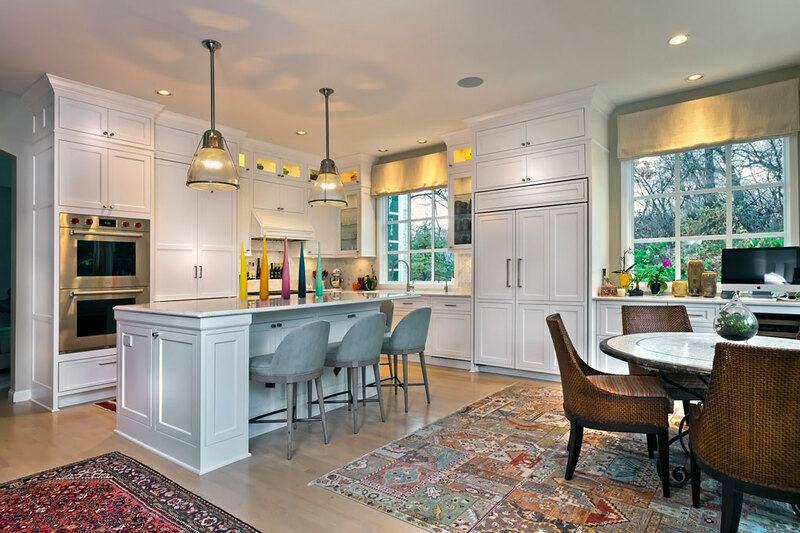 The designers rejuvenated this well lived-in space with traditional white cabinets warmed by wood floors and colorful rugs. 3rd Place, Lynn D. Monson, CMKBD, Monson Interior Design/Dreammaker Bath & Kitchen, and Ron C. Beltz, JIT Companies, Inc. 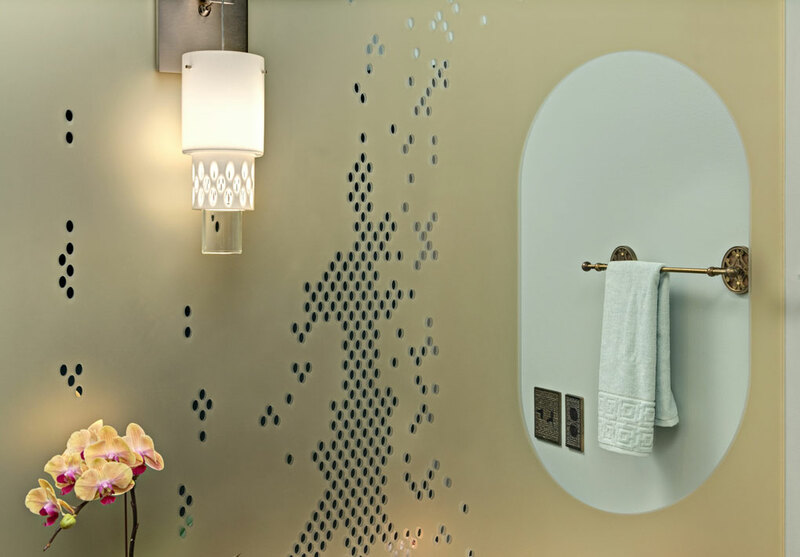 The designer and craftsman collaborated on this unique mirror, a laminated assembly of mirror, gold filter film, and etched glass, for a contemporary powder room. 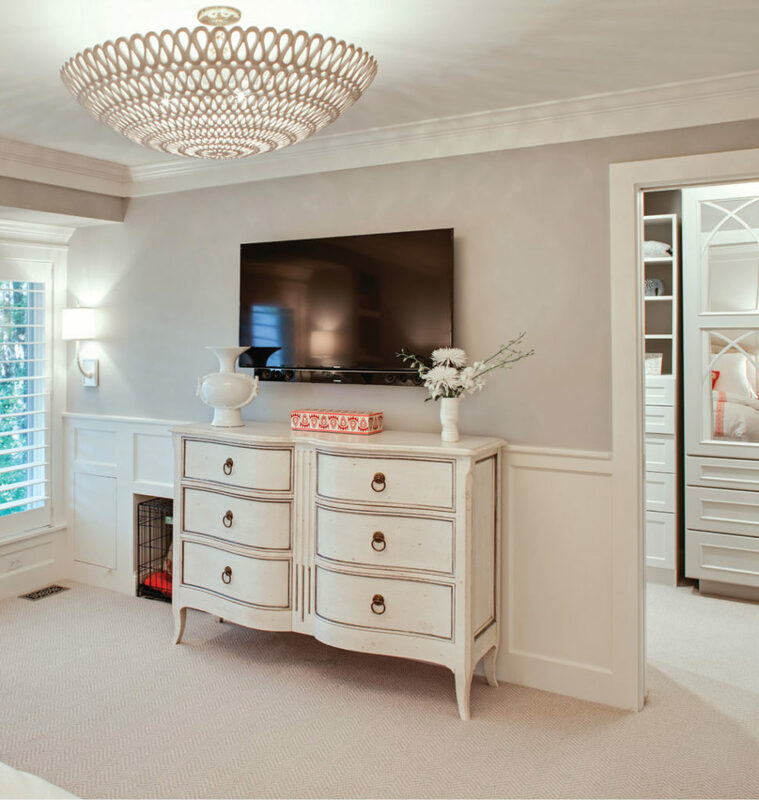 Built-in cabinetry and a wall paneled to the ceiling created a new bed location in this master bedroom. The designer reconfigured spaces to make them more functional and updated the finishes in this elegant, Belgian-style kitchen. 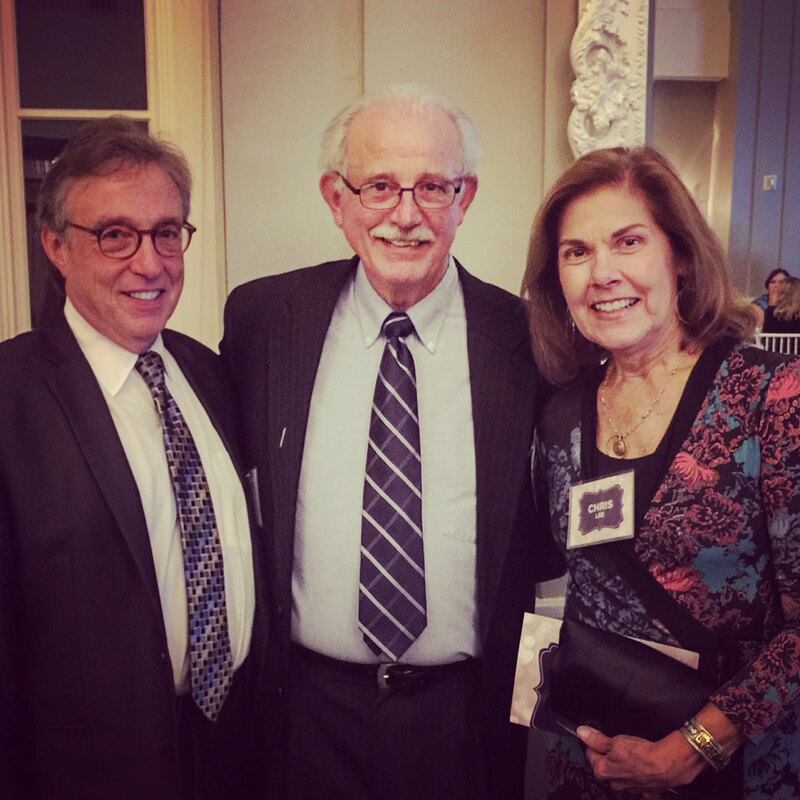 Michael (center) celebrates with Steven Ptaszek, CKD, of Imagine That Kitchens & Baths, and Chris Lee, editor of Midwest Home, at the 2016 NKBA-MN’s awards gala at the Calhoun Beach Club.